Nupur Tandon, Founder & Director of Pro Waste Concepts Pvt. Ltd. (OPC) is able to shed some light to the people of Bengaluru by spreading the much needed information about proper waste management. She started thinking about waste management when she moved into Bengaluru in 2010. She felt that talking to NGO and other groups who are working on this sector was not enough as implementation was the need of the hour. Effective segregation of waste is practiced on Jawaharlal Nehru center for advance scientific research. AN JAYACHANDRA, the Sr. Administrative Officer greatly appreciate the effort Nupur Tandon puts in keeping their surroundings clean. The high quality plastic waste and low quality plastic waste are both efficiently segregated. This also includes the food waste and all of these go to specific disposal methods. 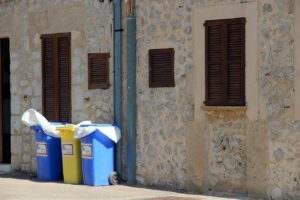 Garbage bins placed around the campus are bright and colorful and also provides a good amount of detail which helps encourages the people to dispose their waste in a properly and effective manner. The green color bin is used to dispose food waste, the red/pink color is used for dry waste and finally the blue one is used for disposable waste such as paper/plastic cups, plates and spoon. In other area of the campus such as the kitchen, progressive waste management is being practiced by encouraging the cook to reduce the use of plastic. Instead of plastic, paper is used to wrap the vegetables. Bio-medical waste is also handled in a timely without contaminating the environment. Each bag is color coded and is segregated into yellow bags, purple bags and the blue bags which are different categories of bio-medical waste. These bags also go into different disposal method avoiding confusion when the time for recycle and disposal arrives. Electronic waste collection centers also exist within the campus that accept e-waste and disposes them properly along with the help of electronic waste disposal agencies. The 12 feet depth composting pit receives organic waste and the dry leaves from all over the campus and is dump in the said area. Once a year the compost is taken out and is used in the gardens. Not only Bengaluru is able to benefit greatly with progressive waste management as clearly this is a global effort benefitting people from around the world. Take part in proper waste management today.